Non-specific image of pancreatic cancer. 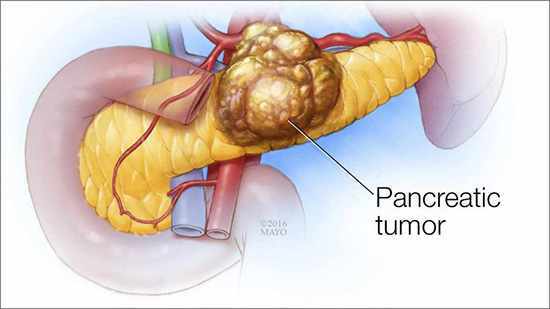 Pancreas neuroendocrine tumors (pNETs) are a collection of rare neoplasms distinct from pancreas ductal adenocarcinoma. Although the molecular profile of pNETs is somewhat unclear, advances in molecular tumor genotyping is one area of research that is advancing the understanding of this disease. In a 2017 article published in Oncotarget, Ferga Gleeson, M.D., M.B., B.Ch., a specialist in gastroenterology and hepatology at Mayo Clinic's campus in Minnesota, describes a targeted DNA next-generation sequencing (NGS) study conducted at Mayo Clinic. "Alterations in MEN1 chromatin remodeling genes and mammalian target of rapamycin (mTOR) pathway genes are the most frequent molecular events identified in pNETs," explains Dr. Gleeson, "But it's unclear whether these biomarkers and other less frequently observed aberrations possess predictive value." The goal of the Mayo study was to assess tumor cytology genotype diversity via endoscopic ultrasound (EUS), and to survey for potential adverse prognostic biomarkers and the prevalence of mTOR pathway variants. 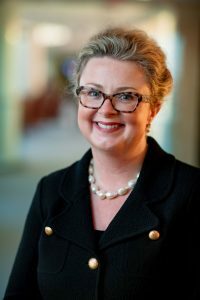 "The premise of our research is that molecular tumor genotyping via EUS fine-needle aspiration has the potential to determine a specific tumor's eligibility for targeted molecular therapy or perhaps immunotherapy, and to facilitate triage of patients into clinical trials based upon their respective tumor genotype," explains Dr. Gleeson. Researchers used a customized 15-gene gastroenteropancreatic neuroendocrine tumor targeted NGS panel evaluating EUS fine-needle aspiration cytology smears from primary pancreas pNETs (90) and pNET liver metastasis (32). The study yielded a number of interesting results that point to the utility of cytology-based tumor genotyping. 21 percent of primary and 28 percent of metastatic liver pNETs harbored two or more variants per tumor. The most prevalent primary tumor variants were in the MEN1 (42 percent), DAXX (11 percent), ATRX (10 percent) and TSC2 genes (8 percent). Patients harboring aberrations in TSC2, KRAS or TP53 genes were more likely to experience disease progression and reduced overall survival, when compared with individuals who were wild-type. Potential prognostic biomarkers in early disease were observed in 3.3 percent of the primary tumor cohort. The mTOR pathway variants, including alterations in PTEN, TSC2 and PIK3CA, were identified in 10 percent of primary tumors and 12.5 percent of pNET liver metastases. Ferga Gleeson, M.D., M.B., B. Ch. This study provides evidence that cytology-based tumor genotyping can reveal a broad spectrum of genetic variants, including possible adverse prognostic biomarkers, reflective of an aggressive phenotype. It also demonstrated the prevalence of potential predictive biomarkers for mTOR pathway inhibitor sensitivity. "We are hopeful that such molecular profiling and patient stratification will become a vital aspect of future efforts to provide individualized and targeted therapy to enhance outcomes for appropriately selected patients," explains Dr. Gleeson. Additional research that Dr. Gleeson and colleagues are involved with demonstrates the utility and partnership of EUS with disease-specific and comprehensive cancer gene next-generation sequencing panels, both commercially developed and Mayo developed. When used together, these tools can enhance the evaluation of pancreas ductal adenocarcinoma, pancreas neuroendocrine tumors, gastrointestinal stromal tumors, lung cancer and melanoma. "Our group's strength is our collaborative partnership with colleagues in Mayo's Center for Individualized Medicine and Department of Laboratory Medicine and Pathology to advance the field of DNA and RNA sequencing to further our molecular tumor genotyping capabilities. Our vision is that this will become part of standard clinical care in the field of precision medicine, to offer a customized approached to patient care based upon the molecular profile within a specific tumor or metastatic site." This article was originally published in Cancer Physician Update, a quarterly publication for physicians that discusses trends and advances in hematology and oncology at Mayo Clinic.